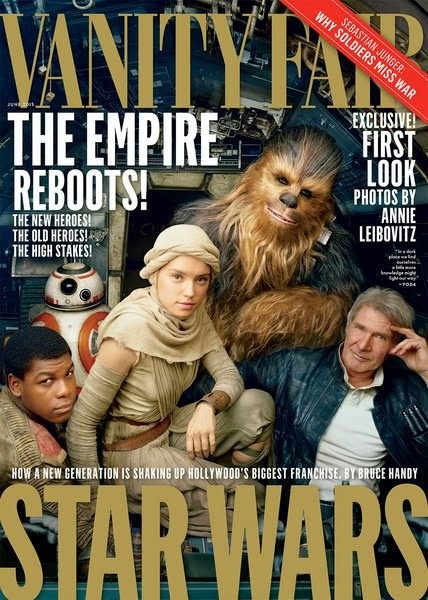 Today, pop culture magazine Vanity Fair released a preview image of their upcoming June issue cover, which features a shot of The Force Awakens characters Rey, Finn, BB-8, Han, and Chewie. The issue will hit newstands this week, along with special exclusive content about The Force Awakens on Vanity Fair's website. You can see the previewed cover below! 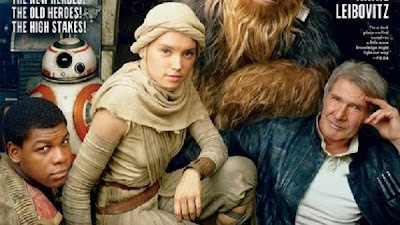 The photo on the cover was shot by iconic portraiture artist Annie Leibovitz, who also shot similar Star Wars "family portraits" for the prequel films last decade. It's fantastic seeing Star Wars return to the forefront of popular culture! I can't wait to pick up my copy! how does Chewie stay so young? Rumors of surgery abound page 27. Wookies in Star Wars Lore live hundreds of years. Well it's his hair he needs to look after, not his skin right? smh.. Between the new trailer and this pic of Han & Chewie, I'm going from having zero interest in what I expected to be a full on atrocity to wiping a tear from my jaded eye in anticipation of what may be one the greatest cinematic revivals of all time. Can not wait!!! So is she confirmed as Jaina Solo?